As many of you know, I have PCOS (Polycystic Ovary Syndrome) which is one of the reasons we had to go through IVF (In Vitro Fertilization) to have Brexton. PCOS can look different for a lot of people, but for me it’s battling with adult acne, hair loss and having sucky ovaries that don’t know how to make a good egg because my hormones aren’t right. Even with birth control to help regulate my hormones, things still get out of whack in my body. One thing I learned is that eating soy (especially the processed kinds) makes my hormones even crazier. Simple, I thought. I told myself I just wouldn’t eat edamame and I would switch my soy milk to nut milk, easy. WRONG! Soy is in everything! No, for real, it’s in cereals, cookies, chips, breads, salad dressing, breaded items, baking items, cooking sprays, the list goes on and on. Huffington Post wrote an article, The Top 10 Foods You Didn’t Know Contain Soy, that said a night out, “could include bread to start and a French onion soup to share. For your main course you choose a steak, Caesar salad and baked potato. For dessert, a slice of cheesecake. And as you are leaving, you grab a mint. Looking over the allergy menu you find that every single one of these menu choices contain soy — even the mint.” Sigh. I also don’t eat red meat and most other meats. I haven’t since I was about 12, and when you train hard and workout a lot you need to get your protein in. So not eating a lot of meat and trying to avoid soy makes it pretty difficult to find healthy, high protein options. Now don’t get me wrong, I’m not advocating to stop eating soy, everyone’s body is totally different. However, for me personally, I have noticed that when I eat a lot less of it, things seem better for me. So, if you are like me and have noticed that you and soy don’t get along too well, here are some yummy soy-free products that I enjoy often. Most of them are protein packed too, which is great if you are trying to get in more protein all the time like me! I have linked them on Amazon because, if you are like me, you probably have an Amazon Prime addiction! I would also like to note that I am not sponsored by any of these products, they are just ones that I have found on my own and I really like! Many protein bars contain a soy protein isolate, but I have found two bars that are really yummy! No Cow bars are non-dairy, low sugar, high protein and are made with a brown rice and pea protein blend and they have a unique soft texture. My favorite flavor is the mint chocolate chip. 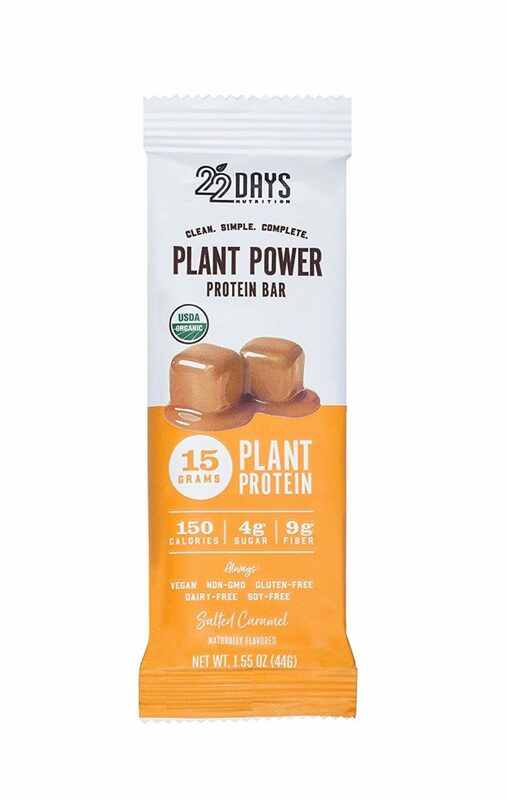 The other brand I enjoy is 22 Days Nutrition, the salted caramel flavor is delicious. They have more of a taffy/protein bar consistency, which I like. The bars have 15 grams of protein and are non-GMO, gluten free and low sugar. This isn’t a protein bar, but it’s a high-protein add on that is great for throwing in with cereal, yogurt or on anything else you can think of. 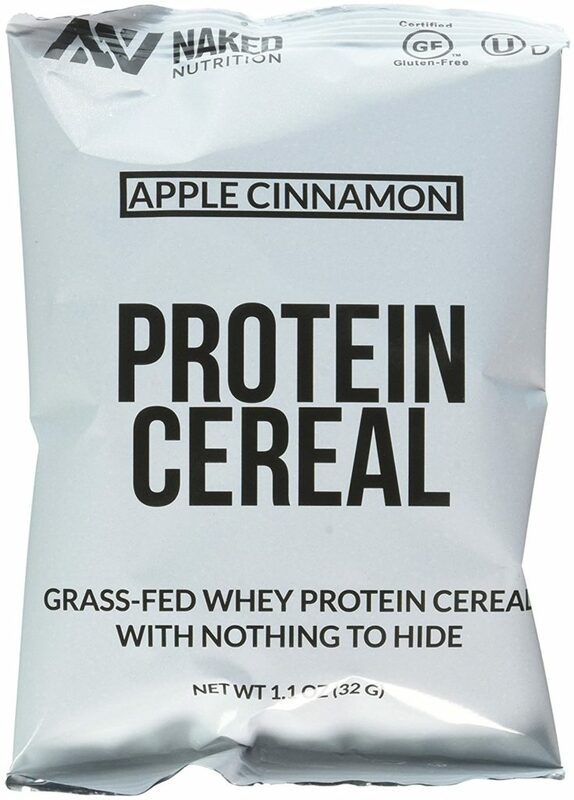 For those trying to introduce a lot more protein into your diet these little crisps are for you! 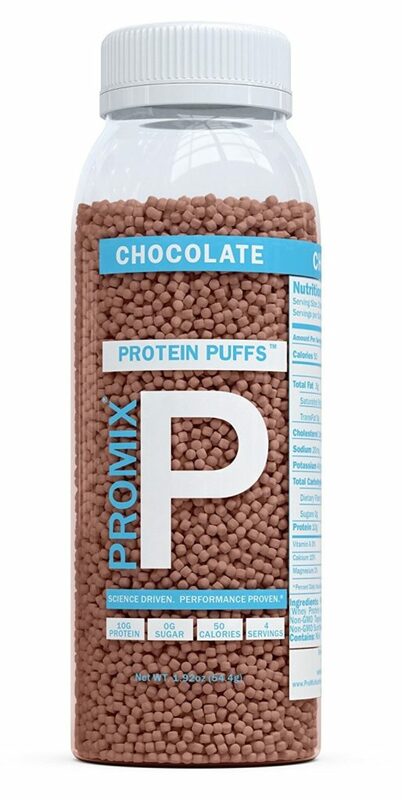 The PROMIX Protein Puffs are Whey-based, soy-free and pack 10 grams of protein in just 50 calories. I used to eat Special K Protein Plus all the time until I actually read the ingredients and realized it was made with soy. And many of the cereals out there that were soy free didn’t have much protein in them at all. So, after searching Amazon, I found Naked Nutrition, a whey protein based cereal that packs 15 grams of protein and only 5 grams of carbs per serving. The apple cinnamon flavor is my favorite! It keeps me full all morning long in comparison to regular cereal. I love to eat oatmeal, but I sometimes felt like I was just eating a big ol’ bowl of carbs. I know that oats are heart healthy, but I wanted to find something that had even more health benefits. 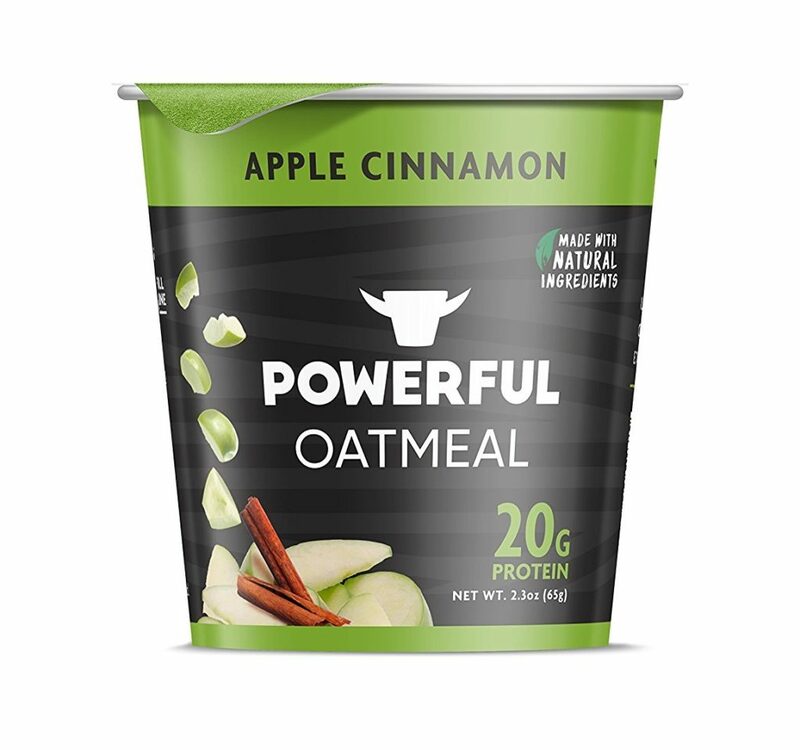 I really like Powerful Oatmeal because even though it still has a decent amount of carbs (35 grams), it also has 20 grams of protein, 4 grams of fiber, plus calcium, iron and potassium. For those of you who are not looking for high protein, but a high fiber bar perfect for a snack on the go or those that don’t really have the stomach for a big breakfast, NuGo Fiber D’Lish bars are awesome! One bar has almost 50% of your daily value of fiber. The texture is perfect, kind of like a moist granola bar, and the flavors are all delicious. It’s hard to eat just one of them! Another option is granola. Granola is so yummy, but if you look, a lot of brands pack them full of sugar and most don’t even have protein in them. 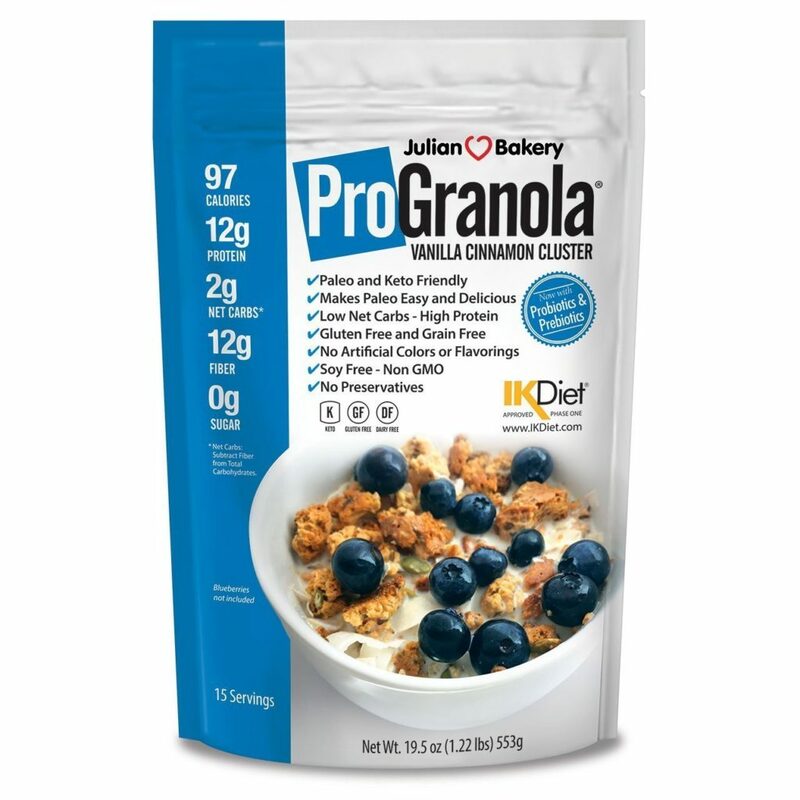 I stumbled upon Julian’s Bakery Pro Granola and now I have a serious obsession. It is Vanilla Cinnamon Flavor and has coconut pieces and sunflower seeds in it. It is soy-free, high protein, low carb, non-gmo and gluten and grain free. The list really goes on and on and the taste is amazing! Now, it’s not your typical super-sweet granola and a lot of times the clusters have all crumbled by the time it gets to your house. However, I still think it is perfect to mix with cereal or top my Greek yogurt with. 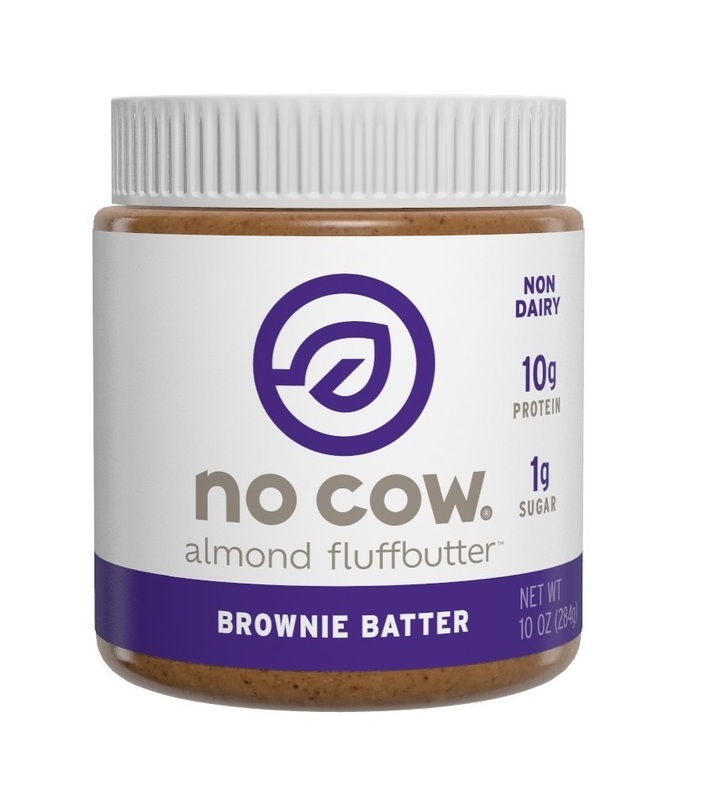 The makers of the No Cow protein bars above also make a fluff butter. What is it? Flavored almond butter! (I’m obsessed with the brownie batter.) This deliciousness packs 10 grams of plant protein with low sugar and it’s also gluten free and vegan. It’s so darn good that sometimes for dessert, I just eat a big spoon full of it. But you can also put it on top of stuff or bake with it. Their website has lots of recipes but I’m still a fan of by the spoonful – its easier and less dishes!! Having PCOS and dealing with the symptoms is hard enough as it is – then throw in having to watch what you’re eating and it can consume your life. 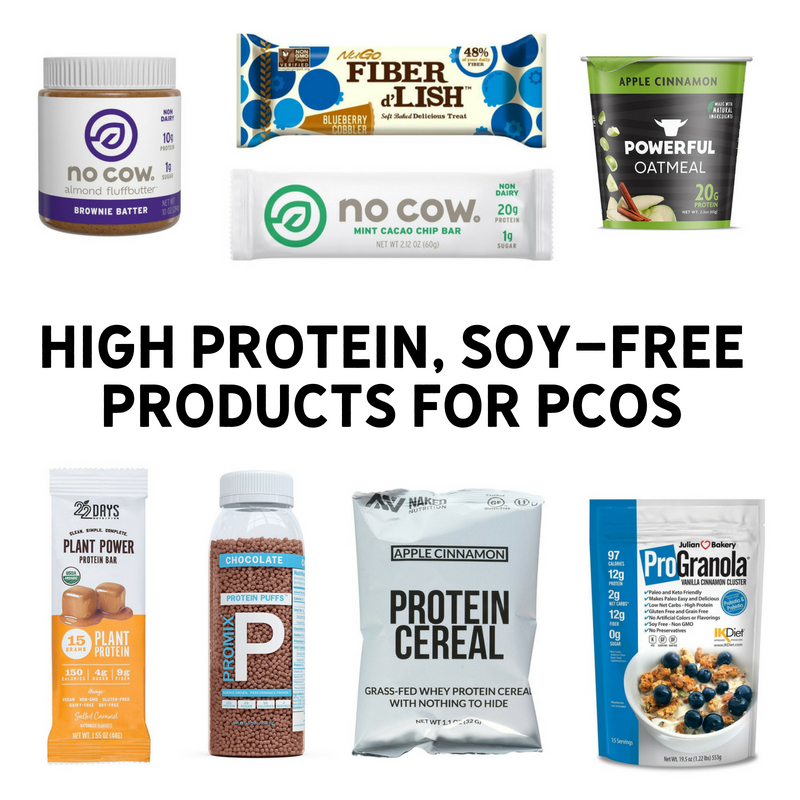 I hope this short list of my favorite high protein, soy-free products is helpful to some of my PCOS sisters out there. If you have other tips or products you’d like to share, please leave them in the comments below!